Ash cave is like a little Disney Land. You park your car, walk for a while, see tons of people, and finally, you arrive at what everyone came for. This is quite a place, and for some reason, having half a county there almost makes it more spectacular. Megan, Weston and I made a quick trip to visit friends as they were spending the weekend in a cabin in the famous Hocking Hills region of Ohio. For our afternoon excursion, we ventured to Ash Cave, part of Hocking Hills State Park. The HH region is a mecca for central Ohioans- it is so popular that I typically stay away during busy weekends, but we had a very nice time, and so many people added to the excitement. Ohhh, thanks for sharing this. I've been to Hocking Hills, but somehow missed Ash Cave. I've been wanting to take my family there, we need to go soon. Beautiful reflected light on the roof of the cave. Is that natural off the water or do I see Megan in the foreground holding a remote flash? Butch- That is someone else taking a picture of Ash Cave. This was done with all natural light. Wow...that's a great cave! Even with a lot of people, it had to be a fabulous sight. I can imagine the Native Americans knew this place well. I will have to investigate some books about this place. I have never been there. With my breathing problem it would probably be too far for me to walk. I did enjoy your photograph and story with it. Great shot Tom I would love to go back and visit this place again, I have been there once and loved it, if I can find the time I will go and explore some more !! Lovely shot of Ash Cave, Tom. I was just up there myself recently. Love all those great spots of the Hocking Hills. I'm actually in the middle of composing a post about some of the HH's waterfalls, and I'm featuring this one at Ash Cave and the one at Conkle's Hollow. Note to Abe Lincoln: you better believe the Native Americans knew about this place. I don't know all the details, but I just attended a semi-historical program of the cave where it was mentioned how they used one of the very large rocks as a giant mortar and pestle for grinding their grain, and also that burial sites were found with Native American markings on the "headstones". Oh, and Tom, I hope you're feeling better! I liked those flower shots from your last post! Lisa- It is a great place to visit. Mary- It is very cool. The sound is amazing, as everything bounces off the cool wet sandstone above. Abe-Very nice! Can't wait to see what you got, and the images that you can capture. I'm saving up for a canon supertelephoto. The reason why the cave is named "ash cave", i've heard, is because the ground of the cave was covered with ash piles from native American fires. Bernie- The hocking hills are a wonderful place to explore and photograph. 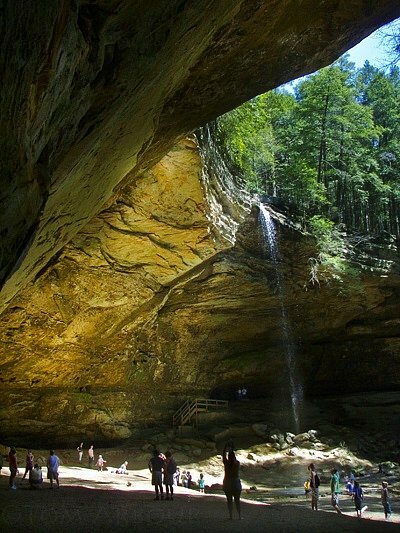 They are probably one of Ohio's most famous natural places. Thanks Heather- Good to meet you and welcome. Tom: Never heard of this one, must be more of Columbus area attraction. I sure will put it on the list. It was interesting that your grandparents lived in Brady Lake. Wow, what an impressive site. Really love the waterfall, I'll bet it would feel good to get under it on a hot day. Tom- You've heard of the Hocking Hills though, right? Ash Cave is part of the HH state park and forest, it is quite popular even with N.E. Ohioans, there even was a church bus in the parking lot on the day we visited from Akron. Lana- That would be very cool. Not sure if it is legal, but it would be very cool. John- Yes, and it was unseasonably warm on this day, so the local kids flocked to this area to cool off in the plunge pool. Kelly- Thank you, please stop by often. Very beautiful ! I will love to go there one day! I love it! I was at ash cave and a huge spider was crawling on me and my girlfriend. It was the colour of the clay soil at the bottom of the cave. If anybody could identify it for me I would be very excited. It was very large and looked like it might have been fuzzy. We followed it back to its burrow and it was under the rocks right outside the base of the cave.